Usha Ramanathan, in the first of a multi-part series. The Unique Identity (UID) project has been around for over four years. The Unique Identification Authority of India (UIDAI) was set up by an executive notification dated 28 January 2009 and came into its own after Mr Nandan Nilekani was appointed as chairperson in July 2009. Now it has, as some observers say, become an experiment being conducted on the entire country. In its early stages, it was marketed, simply, as giving the poor and the undocumented an identity. It was to be voluntary, and an entitlement. But, it is evident even from the Strategy Overview document of the UIDAI that it was never intended to be an entitlement that people may choose to adopt or ignore. That document said that “enrolment will not be mandated”, but went on to add: “This will not, however, preclude governments or registrars from mandating enrolment”. So, the potential for compulsion was built into the architecture of the project. Starting in 2012, voluntariness began to be eroded, and threats of exclusion from services and entitlements began to be bandied about. By January 2013, a virtual panic was set off when it was announced that various services and entitlements would not be accessible to persons who did not have a UID number. Mr Nilekani has said time and again that half the population is expected to be enrolled by the end of 2014; yet, there have been warnings that people without a UID number may find themselves unable to access benefits and subsidies if they did not have it, if a bank account had not been opened, and if the UID number were not embedded in the bank account. So, subsidy for cooking gas, kerosene, and scholarships, for instance, became dependent on having a bank account seeded with the UID, or aadhaar, number. In case anyone wonders what the UIDAI has to do with these decisions, it is the chairperson of the UIDAI, Mr Nilekani, who chaired the committees that recommended these changes. The reports are in the public domain. From its inception, the UID project has been about creating the ‘database resident’. The website of the Department of Information Technology, which has been renamed as Department of Electronics and Information Technology, modestly carrying the acronym DeitY, has said all along that “Project UID, a Planning Commission initiative, proposes to create a central database of residents, initially of those above the age of 18 years”. Except, that the UIDAI got more ambitious and wanted everyone, from the newborn to the oldest resident, on its database. And it was always intended to converge various databases to construct a profile of the individual, and to this effect the website of DeitY says that “the project envisages provision of linking of existing databases, as well as providing for future additions, by the user agencies”. The MoUs between the UIDAI and various registrars that include the state governments, oil companies, banks and the Registrar-General of India, who is in charge of census and the National Population Register and socio-economic and caste census, not only provide for various additional fields of data being collected during enrolment, but also for having the UID number appended to each such database. There is more to cause concern, and much to be answered about UID. The UID project is proceeding without the cover of law. There is only the notification of January 2009 which says the UIDAI “owns” the database, but which says nothing about how it may be used, or what will happen if it fails or if there is identity fraud, or some outside agency gains access to the database. A Bill was introduced in Parliament in December 2010, after the project had been launched and data collection had begun. The Bill collapsed in December 2011 when the Parliamentary Standing Committee found it severely defective, and after it found that the Bill and the project needed to be sent back to the drawing board. There is no sign yet of a Bill, and any protection that the law may offer is non-existent. There is no law to protect privacy either. The UIDAI, and Mr Nilekani, have refused to address the probability of surveillance, convergence, tracking, profiling, tagging and intrusions into privacy that is likely to result from the creation of the database of residents and the intended convergence. The link between technology, databases, governmental power and corporate involvement in creating, maintaining, managing and using databases has produced various scenarios of surveillance that we ignore at our peril. PRISM is such a stark demonstration of the ambitions that can fuel a state that the UIDAI can no longer just say `no comment’ when asked about the surveillance potential being created. In the same period, the state has already set up agencies such as the Natgrid, NCTC, NTRO, CCTNS, MAC which will use the potential for convergence of databases that the UID makes possible. In April 2011, the government made rules under the IT Act 2000, by which it would be able to access any data held by any “body corporate”. More recently, we have been hearing about the CMS, or the Central Monitoring System, speaking to a surveillance and control approach that will have the state snooping on us with no oversight, no prior permission, no answerability at any time to anyone. The companies engaged by the UIDAI to manage the database include L1 Identity Solutions and Accenture. The UIDAI, in response to an RTI request, has claimed that they have no means of knowing that these are foreign companies, given the process of their selection! Yet, a search on the internet reveals the closeness between the L1 Identity Solutions and the CIA, and that after a recent transaction, it is part-owned by the French government; while Accenture is in a Smart Borders Project with the US Department of Homeland Security. Data security, personal security, national security and global surveillance are all drawn into a ring of concern, but remain unaddressed. LUCKNOW: Taking cognizance of complaints of ‘ casteism’ practised allegedly within the precincts of the Lucknow regional office of Unique Identification Authority of India, the National Commission for Scheduled Castes has asked UIDAI’s regional office, Lucknow to submit a probe report and action it intends to take by May 21. The May 7 letter issued by the NCSC state office for UP and Uttarakhand seeks the response of the UIDAI Lucknow office by May 21, 2013. TOI has a copy of the letter issued by the NCSC. Adding weight to the claims of Vijay, four other former staffers of UIDAI Lucknow, who were “sacked”, have lodged a complaint before the National Human Rights Commission alleging harassment by the two ADGs and the assistant. TOI has a copy of the NHRC complaint as well. All the complaints are currently under consideration of the NHRC. Debashish Gargory, one of the five complainants, says, “We have been made to suffer as we did not follow the diktats of these officials, especially Abhishek Mishra, who works at the behest of the two ADGs.” Gargory adds, “We even tried to raise our concerns before the senior officials of UIDAI Headquarter but we did not get any response to our emails. Finally, on April 13, we decided to move the National Human Rights Commission.” He also alleged manipulating of attendance in the office, and ADGs turning blind eye to it. As if the complaints of alleged harassment were not enough to highlight a seemingly sad facet of the UIDAI, a number of RTIs addressed to the UID headquarters Delhi and Lucknow regional office also indicate that all is certainly not well. In one of the RTI applications, the applicant has sought information regarding the justification of providing high-end mobile phones and staff cars to officers who are not eligible for the same. Several other questions in the RTI applications (copy with TOI) hint at rules being possibly tweaked in the name of running a “project”. The Unique Identification Authority of India (UIDAI) was set up by an executivenotification dated 28 January 2009. As per the notification, the Planning Commission was to be the nodal agency “for providing logistics, planning and budgetary support” and to “provide initial office and IT infrastructure”. As part of its “role and responsibilities”, the UIDAI was to “issue necessary instructions to agencies that undertake creation ofdatabases, to ensure standardisation of data elements that are collected and digitised and enable collation and correlation with UID and its partner databases”. It was to “take necessary steps to ensure collation of the National Population Register (NPR) with the UID”. And, the UIDAI “shall own and operate” the UID database. One need not necessarily have an Aadhaar number as of now for availing of monetary benefits under government schemes such as Employees Provident Fund, insurance and pension or for booking railway tickets and opening bank accounts. As far as the current status of Aadhaar number – meant for direct transfer of subsidies to beneficiaries to plug leakages — is concerned, it is not mandatory for any of the government schemes. An official from the Unique Identification Authority of India told dna, “As of now Aadhaar number has not been made mandatory for any of the schemes of the central government. Even though Aadhaar has not yet been made mandatory for schemes such as EPF, the Employees’ Provident Fund Organisation, under the ministry of labour and employment, has asked its field offices to make maximum efforts to obtain the available Aadhaar number or the enrolment number of the EPF members, in a communication dated February 6. It is clear that the government intends to make Aadhaar mandatory for schemes such as EPF and pension but the scale and time required is coming in the way. The EPFO, vide its letter dated January 21, made it mandatory to submit Aadhaar number for new EPF members joining on or after March 1. 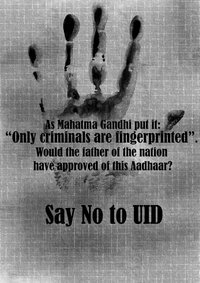 A labour ministry official said, “During discussions with the UIDAI, it emerged that UID is not enrolled in all the states. Therefore it was decided not to make Aadhaar number mandatory. And an order was subsequently released,” said the official. Similarly, in the case of railway reservations, Aadhar card is only one of the documents required. In case of opening of savings account in banks, Aadhar will work as one of the documents required, and has not yet been made mandatory. Existing bank customers as well as new customers can link their accounts with Aadhar number to avail of subsidies on LPG cylinders directly. Even this is not mandatory and is under optional head in the Aadhar application form. Close on the heels of Maharashtra’s information technology (IT) department losing unique identification (UID) data of about three lakh people collected for the Aadhaarnumber scheme, here is a first person account about the registration mess. This also highlights the dubious games being played by agencies and registrars appointed by the Unique Identification Authority of India (UIDAI) led by technocrat Nandan Nilekani. A Moneylife reader registered for his Aadhaar number but could not even getacknowledgement receipt for the enrolment. In addition, when he raised the issue with top officials of the registrar, Oriental Bank of Commerce (OBC) and the agency, Euro Finmart, he claims to have received abusive calls! The UID or Aadhaar registration was carried in our society during the last week of February 2013. The way the work was carried out by the agency was complete mess. The employees of the agency (Euro Finmart, I came to know later) used to arrive in the afternoon. They always used to walk in without any proper equipment, so residents used to provide it to them. Some of the residents from our society were not even provided registration receipts from the agency. Without the registration receipt, it is very difficult to track the progress of issuance and delivery of the Aadhaar number. One of my neighbours told me the name of the agency, Euro Finmart and the registrar, Oriental Bank of Commerce (OBC). OBC was appointed by the UIDAI to carry outAadhaar registration work across Maharashtra and it was the lender that appointed Euro Finmart to do the job on its behalf. Since we were not given our registration acknowledgement receipts, on 27th February, I called up Euro Finmart’s nodal officer on his mobile. In addition, I also sent him a mail. The officer promised to call back after checking the details. However, the call never came. On the same day, I called Kamal Seth from Delhi who was the chief manager at OBC looking after the Aadhaar registration project. He clearly told me that the registration carried out by the agency (Euro Finmart) in our society was illegal as it was done outside the OBC branch. However, he assured that we would receive our registration receipts after he checks the details. Following instruction from Mr Seth, another officer, Mr Mathews from OBC’s regional office in Mumbai contacted me. He also gave the same assurance about the registration receipts. Surprisingly, after my conversation with Mr Mathews, the registration work being carried out by Euro Finmart in our society was suddenly stopped. After waiting to get registration receipts for over 15 days, on 14th March, I again called up Mr Seth. He repeated his assurance but nothing really happened till 26th March. On 26th March, I called up the office of SL Bansal, chairman and managing director (CMD) of OBC, seeking assistance. The official on the other end asked me to send the details. Within hours after sending the details, several top officials from Euro Finmart and the chief manager from OBC called me assuring that we would receive our registrationacknowledgement receipts soon. Meanwhile, I also received some abusive calls from ‘angry’ employees claiming to be from the agency. Fortunately, I recorded all such calls and then showed it to the top officials from both the agency and the bank. Finally, on 28th March the registration acknowledgement receipts were delivered in our society office. It took me over a month and call to the CMD’s office to get just the registrationacknowledgement receipts for the Aadhaar number. Later I checked the terms and conditions of the memorandum of understanding between OBC and UIDAI. As per the terms and conditions, OBC was supposed to supervise the enrolment work being carried out by the agency. But from my own experience, I can say, the bank failed to do its job. Not a single employee from OBC was present during the enrolment in our society. In addition, they kept quiet for over a month, until the matter reached their CMD’s office. It seems that OBC employees were protecting the agency for reasons best known to them. OBC is carrying the work with the agency for entire Maharashtra region. Imagine the plight of average citizens who cannot do the follow up. They would be in fix as all the cash subsidy depends on UID. OBC has appointed Euro Finmart (L-1 bidder) and Shri Ram Raja Sarkar Lok Kalyan Trust (L-2 bidder) as empaneled agencies for UID enrolment in Maharashtra. Apparently, the L-2 bidder was asked to match the prices quoted by the L-1 bidder. As a rule, the government likes creating new structures without fully understanding their implications and then disbanding them once criticism inundates the newspaper columns. A lot of time and money is invested in creating these structures and, often, these costs could be higher than the cost they are trying to lower to begin with. The direct cash transfer (DCT) scheme runs a similar risk, since our enthusiasm levels are currently high, and we could go off the track unless certain preconditions are addressed. It is generally felt that DCTs are a more efficient system than, say, physical subsidies. This does hold when conditions are ideal and back-end structures are in place. Otherwise, there could be contradictions that will make the DCT scheme unsuccessful. DCTs come into play for two kinds of transfers. The first is where a new structure is created for transferring cash-for-cash transactions. This holds for, say, salaries, pensions and scholarships and so on. The existing scheme has various departments sending cheques to the recipients, who, in turn, deposit them in their own accounts. The second pertains to cash-for-kind transfers. Here, instead of providing the good to the household, a cash transfer of an equivalent amount takes place and can be used to buy the product. The concept of DCT is based on the much-publicised Aadhaar project where a unique identity (UID) has been provided to people. Since every UID has an account linked to the person, such a transaction would be automatic provided the disbursing authority is linked with the banking systems. Given the volumes involved, this would be a logistical challenge. The advantage for cash-for-cash transactions is efficiency and reduction of leakages provided the identification process is robust. Prima facie, there is nothing amiss here. When it comes to cash-for-kind transactions, the situation is different because we have to give up the existing structures since substitution takes place. There are essentially five “Ss” that have to be tackled before bringing about any change in the transfer system. The first is “structures”. We have an elaborate procurement system for food grain that is motivated by, one, procurement for distribution and, two, creation of a buffer. The procurement policy is an open-ended one where farmers can sell a fair average quality to the Food Corporation of India (FCI) at a predetermined price. The idea here is to protect the farmer’s income. Have we thought of what will happen to this policy or FCI (an institution set up for this purpose) when we provide cash transfers, and FCI will then have to address only the issue of buffer stocks? Second, “systems” have been created for distribution – the public distribution system (PDS). If we have a “conditional cash transfer” in which money given has to be used to buy grain from fair price shops, then the status quo would be preserved – along with the current inefficiencies. However, if it is not a conditional transfer system, then new issues emerge. There are around 500,000 fair price shops across the country that on an average employ one million workers. By introducing cash transfers and disbanding PDS, there will be an issue of unemployment, since it will be hard for these people to reinvent their stores that are mostly located in rural areas. Today, when there is opposition to foreign direct investment in retail, we are talking of the local kirana shops. There will be a lot of noise when we think of displacing these one million workers. Do we have a solution here? Third, “selection” is an important consideration for a successful DCT scheme. The problem with PDS, besides the ubiquitous leakages, is adverse selection. A lot of people who are not poor take in these entitlements. This becomes acute as we move to kerosene and liquefied petroleum gas. The new scheme on UID is no different from the existing policy of self-declaration; since no proof of income is asked for it runs the risk of adverse selection. In fact, there are a large number of people holding on to the coloured ration cards and not drawing rations. In the new dispensation of the scheme, this could mean free money for them. Do we have a way of screening households or else will we be back to also helping those who do not require assistance? Fourth, the government is talking aggressively of food “security” with an ambitious target of covering two-thirds of the population. Clearly, there is a major contradiction here. If we are to provide cash transfers, then how do we reach the food grain to the needy, which requires PDS? Fifth, there has been debate on the food “subsidy” burden. The subsidy is the difference between the economic cost and the issue price for wheat and rice. The economic cost varies between Rs 17 and Rs 24 a kg, and the issue price is around Rs 5 to Rs 8 a kg. This is when the food grain is sold at a fixed price. Now, once the people are paid cash, they have to buy food grain on their own from the market. Based on government data, the price of wheat and rice varies from Rs 15 to Rs 35 a kg in different parts of the country. Two practical problems arise here. The cash to be paid in lieu of subsidy will be substantially higher than the present subsidy amount. Second, with inflation being variable, fixing the prices and, hence, subsidy level across states will be difficult, and one can see a lot of politics coming in the way of arguing for higher levels of allocations. To make the DCT scheme effective, we need to fix these five “Ss” first or else we would be running conflicting parallel systems. We also need to evaluate the exact benefits of the cash-for-cash transfers before embarking on the more onerous cash-for-kind transfers. Besides, the cash-for-cash transfers alter the mode of payments without addressing the issue of selection. It is, therefore, advisable that we move one step at a time and not get carried away. NEW DELHI: Concerned over the functioning of UIDAI in its current form, a Parliamentary Panel today asked the government to come out with a fresh legislation to provide legality to the Authority. “The Committee strongly feel that in the absence of legislation, Unique Identification Authority of India (UIDAI) is discharging its functions without any legal basis,” the Standing Committee on Finance headed by BJP leader Yashwant Sinha said while presenting a report in Parliament. The Committee in its earlier reports had urged the government to reconsider and review the UID scheme to bring a fresh legislation before Parliament. The Committee said it is also concerned that during the last three financial years (up to January, 2013), a huge sum of Rs 2,342 crore has been spent on the scheme and Rs 2,620 crore has been allocated in BE 2013-14, out of which Rs 1,040 crore is earmarked for ‘Enrolement Authentication and Updation’ pending legislative sanction of the scheme. The Committee has asked about cost per card incurred by the government to generate Aadhaar cards by UIDAI. That apart, the report said, despite an average growth rate of 7.9 per cent in the 11th Five Year Plan, there was no substantial increase in employment opportunities. It said the government needs to more than double its existing skill training capacity of 45 lakh to achieve the ambitious target of skilling 5 crore people in the 12th Plan (2012-17) including 90 lakh in 2013-14. “The Committee also recommend that like Right to Education there should be compulsory skill development programme,” it said. The Committee was, however, satisfied that 173 of centrally sponsored schemes (CSSs) at the end of 11th Plan will be restructured into 70 schemes. It will help streamline, restructure and rationalise such schemes to enhance their productiveness, it added. Also, the Committee supported the 12th Plan’s goal for faster, more inclusive and sustainable growth. It said that to achieve the goal of sustainable growth, various schemes in field of health, education, water and protection of environment should be reviewed. It added that more funds should be allocated for treatment of cancer. Among others, the Committee observed that the targets in the field of electricity generation, coal production and gas production could not be met during the 11th Plan. “The Committee also desire that an Action Plan may be formulated for giving thrust to renewable energy as an alternative source of power,” it said. It also observed several deficiencies in implementation of Rajiv Gandhi Grameen Vidyutikaran Yojana ( RGGVY) aimed at providing electricity to all rural households. It said that in certain states, even the minimum required hours of supply of six to eight hours of electricity could not be met. “The Committee, therefore, recommend for the comprehensive review of the Scheme and rectification of deficiencies to ensure…improvement in supply of electricity. MUMBAI: The Maharashtra government has admitted the loss of personal data of about 3 lakh applicants for Aadhaar card, an error that has forced the inconvenience of reapplication on unwitting victims and sparked concerns over possible misuse of the data. Containing PAN and biometric information, the data was being uploaded by the state information technology department from Mumbai to the central Bangalore server of the Unique Identification Number Authority of India when it got “lost”. “The information is encrypted when uploaded. While the transmission was in progress, the hard disk with the data crashed. When the data was downloaded in Bangalore, it could not be decrypted,” said an official from the state IT department, which is overseeing the enrolment of citizens for Unique Identification number (UID) or Aadhaar card. The data mostly belonged to applicants from Mumbai. Rajesh Agarwal, secretary in the state IT department, maintained the lost data was highly encrypted and thus cannot be opened without “keys and multi-clues”. Still, fears of misuse persisted. An application for Aadhaar card requires PAN details, proof of data of birth and residence, iris images, biometric data, and, if preferred, bank account numbers. The loss came on top of thefts of laptops with UID data from Mumbai. Though complaints were registered with the police, officials contended the crimes were not necessarily for the data. The information on laptops therefore, they said, might not have been misused. The consequence of this multi-faceted data mismanagement is being borne by people like T V Shah. A senior citizen living in Vile Parle, he applied for Aadhaar cards for his wife and himself but has not received them yet. “For a while, they said they will send the cards soon. I even wrote to the planning commission (nodal agency), but there was no reply. It seems they have lost our personal data, including our biometric details. Now they are telling us to re-register,” said Shah. No explanations were offered to Shah as to what happened to his data. Terrified that his personal data like PAN and SIM details may be misused, Shah is wondering if he should file a police complaint. “I remember reading news reports about a case of forgery in which one person’s PAN card was misused by somebody else to obtain a SIM card. The police made the PAN holder dance from Bangalore to Delhi,” he said. As strong as his concern over data misuse is Shah’s dread of re-registration. The last time, he was told on day one to bring the ration card for the enrolment form. On day two he was informed that forms were issued only from 9am to 10am. On day three he was told forms were exhausted. Days later, he was told to come before 11.30am for an appointment. The next day, he was told to come another day since the person who gave appointments was out of office. Registration for Aadhaar cards is currently underway in Mumbai city and suburbs, Pune, Nandurbar, Amravati and Wardha. Officials said 30 agencies are working in Maharashtra on the enrolment for Aadhaar cards. So far, 6 crore citizens have been registered and 5.25 crore UID numbers generated. In Mumbai, of its 1.24 crore residents, 90 lakh have been enrolled and 85 lakh Aadhaar cards generated. “The data that was lost constitutes over 1% of the total data collected. We have filed police complaints,” said an IT official, stressing that the department was responsible only for enrolment. The gradually increasing currency of Aadhaar is simultaneously exposing the confusion over the system and its deficiencies. While the card is being demanded compulsorily for several services, it is also being refused by some for ostensible errors. Rajesh Agarwal, secretary in the state IT department, clarified that Alimchandani’s card was not invalid. “All cards issued so far bear just the year of birth. Many senior citizens are unable to provide the date of birth. Hence, only the year. Even my card bears just the year,” said Agarwal. The Unique Identification Authority of India (UIDAI) is mulling placing the date of birth too on the card. Those who have been issued cards, however, may not get new ones, said sources. T V Shah, a former hydraulic engineer with the BMC, suffered a different problem. He and his wife applied for Aadhaar cards in 2011, but were never informed of their status. In January, when he went to the BMC for continuing his pension he was told that a photocopy of his Aadhaar card was needed for the allowance to be dispensed. “The BMC finally agreed to accept the enrolment receipt. But now, I have received a letter from the UIDAI to reregister ,” Shah said. Losing data so important – and which could be misused if it falls in the wrong hands – is an act of extreme irresponsibility; the offence is compounded when the loss happens because of the callousness of a government agency, trusted by citizens who think the data are in safe hands. Several questions arise here. What happens if the data do fall into wrong hands and citizens lose plastic money or money from their accounts? Who tracks the route of loss of data and who compensates the citizen? Government agencies must learn to act more responsibly when they have been entrusted with such valuable information. MUMBAI: The state government has now said that no Unique Identification (UID) card enrolment centres will be allowed on private premises, like housing societies or offices, because there are too few resources to register the huge number of people who remain to be enrolled in the city. Instead, UID – or Aadhaar – card centres will be only allowed in government premises, like schools, offices etc, so that the middle-and lower-middle-class population can be enrolled first.Civic officials said members of the middle and lower-middle classes need the UID card first as they are the beneficiaries of various government schemes for which the card will be mandatory.So far, 68% of the 1.25 crore population of Mumbai has been enrolled, which means approximately 70 to 80 lakh of the population has been covered and 45 to 55 lakh remains to be covered. The official deadline for registering the entire population is December 13. “Now, with the enrolment drive picking up and resulting into a huge backlog due to the limited number of resources, the state has decided not to allow UID camps on private premises,” said a civic official. The state government had allowed setting up UID enrolment centres on private premises earlier so as to cover as much of the population as possible. At that time, the BMC had allowed camps in housing societies and private offices so that people residing or working there could be enrolled. A UID card that is linked to a bank account would soon be required to avail of several government schemes, including getting a cooking cylinder subsidy, disbursement of provident fund for government employees and receiving free educational items for civic schools. Currently, there are 145 BMC centres where enrolment is being conducted in the city. All are on government or semi-government premises. Over the next one month, the BMC is going to increase the number of centres to 470, as new vendors have come forward and the BMC has identified spots where new centres can be set up. A centre in Kherwadi is being touted as the largest centre in the country, with 25 machines working simultaneously and enrolling 2,000 people a day. The UID project is the brainchild of technocrat Nandan Nilekani. The card is expected to ensure that citizens get access to all schemes of government and local bodies. The government claims that the card will be important in the years to come as, for any dealing with the government, the card would be required to validate identity.